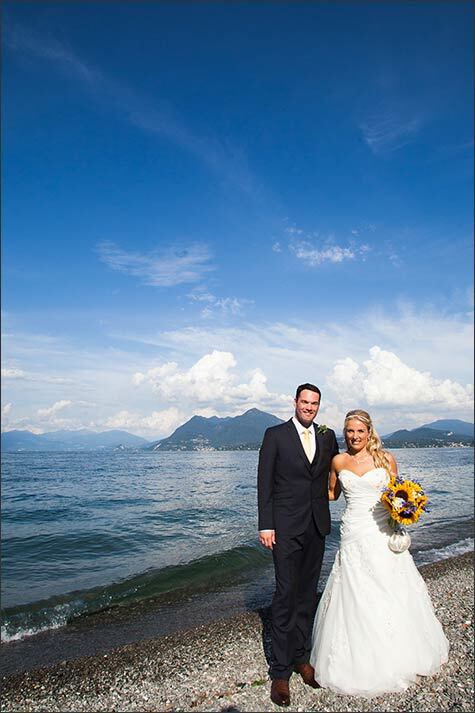 ndrea and Simon really touched blue sky over Lake Maggiore the day of their wedding! 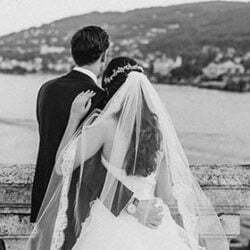 They choose amazing venues for their wedding with stunning views over the lake and we could not miss the chance to tell you the full story. 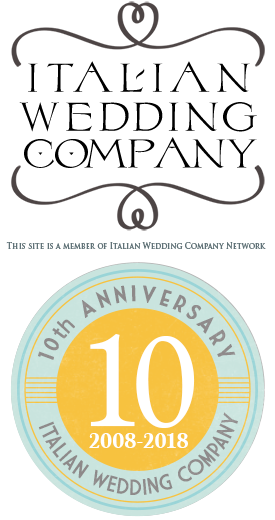 A special thanks also to Enrico Mocci photographer and his team for the great shots. We had the chance to meet Andrea and Simon last winter. 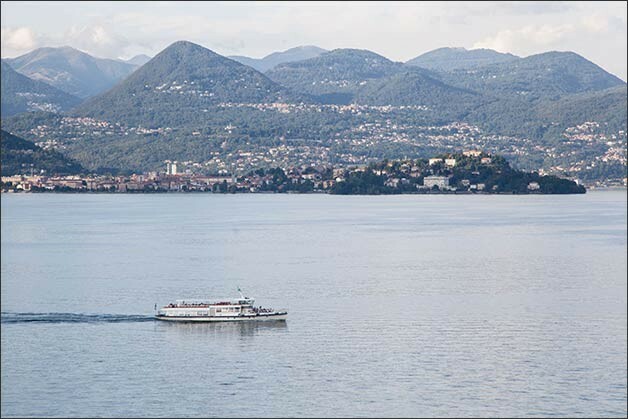 They came over Lake Maggiore after warm recommendation from Sonia and James. Do you remember their lovely wedding? 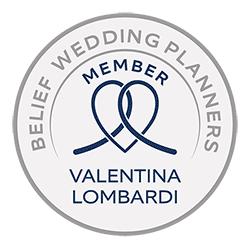 They got married at Villa Rusconi just last summer. 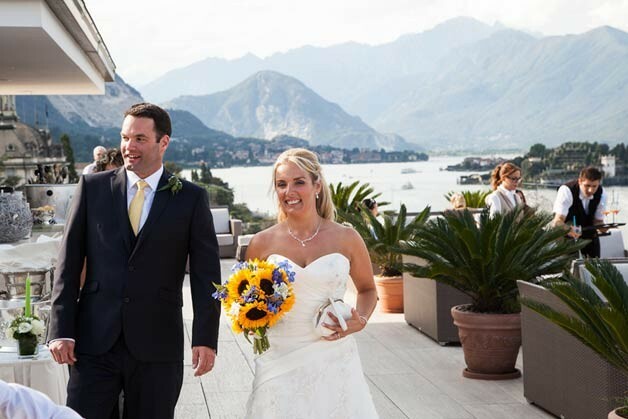 Andrea and Simon opted for something more intimate for a group of about 30 guests and they fell in love with Lake Maggiore as first sight. 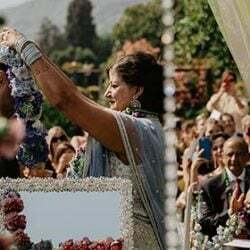 They wanted a wow factor… a stunning view a great panorama so we suggested them two enchanting venues that left them and their guests breathless! 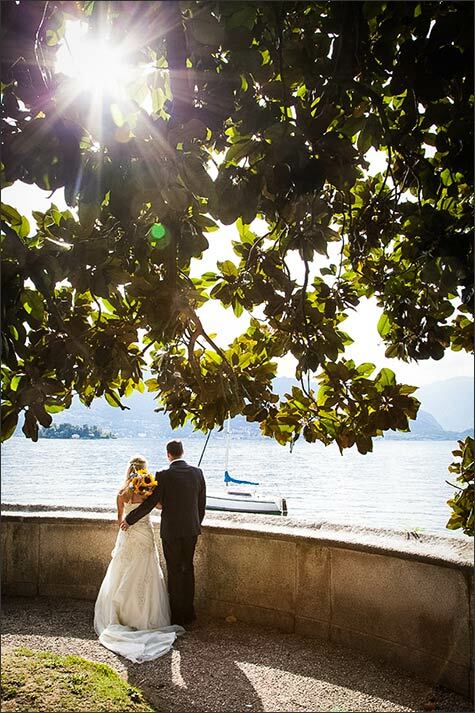 Andrea and Simon decided to get ready, separated as tradition wants in two among the most beautiful hotels in Stresa. 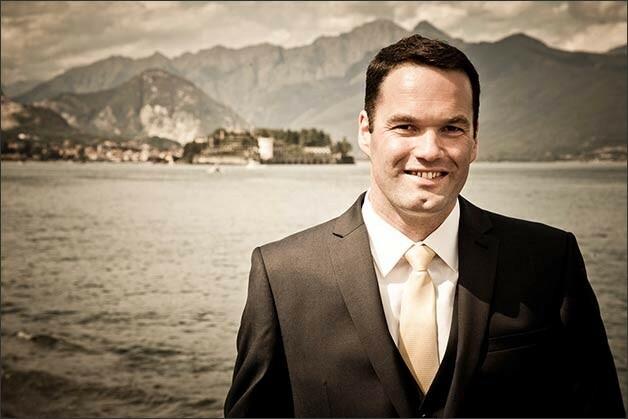 Once ready Simon met all guests at the main pier and got on boar of a pretty motorboat to reach ceremony venue. Andrea did the same once ready. 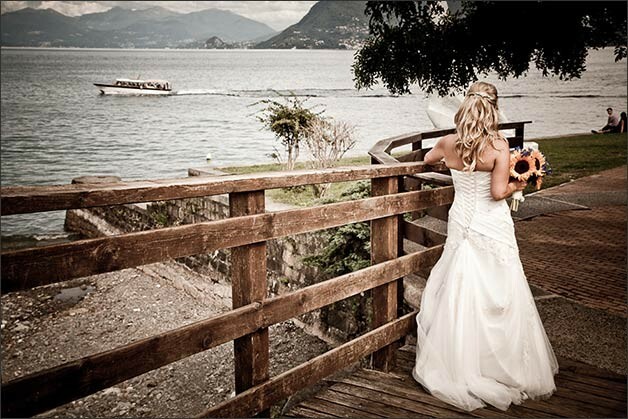 A vintage boat took her and her lovely young bridesmaid from Stresa to Pallanza where the ceremony was planned. 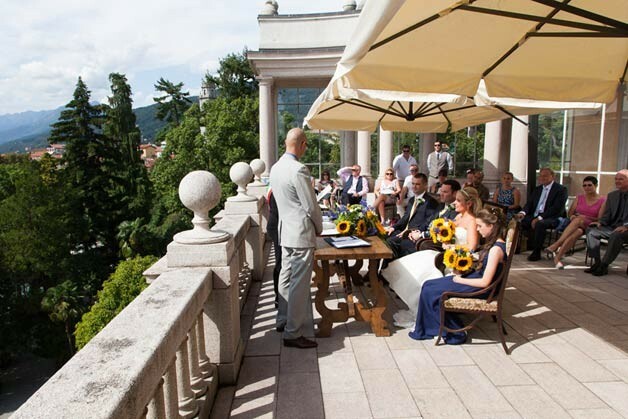 The amazing venue Andrea and Simon chose for the legal civil ceremony overlooking Lake Maggiore is VILLA GIULIA. 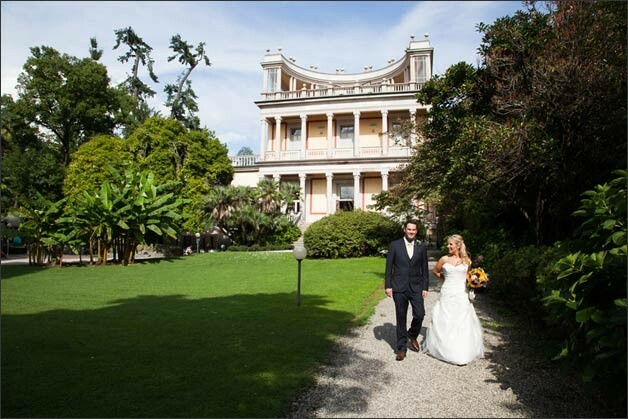 Villa Giulia is a stunning venue owned by the town of Verbania Pallanza. 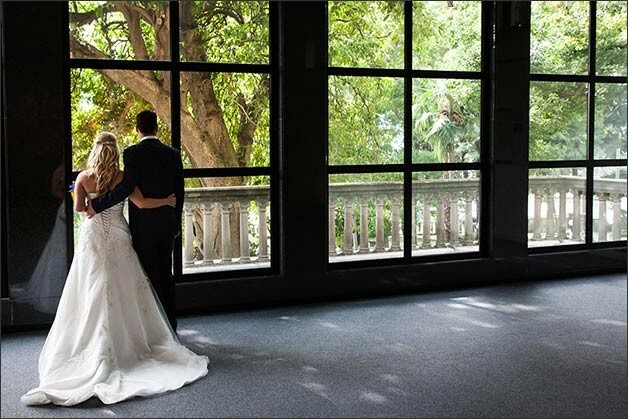 It is used to host exhibitions and legal civil ceremonies. 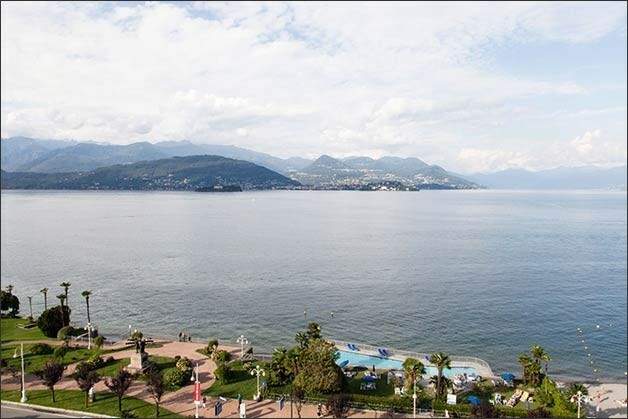 It is a wonderful villa with romantic garden on the shores of Lake Maggiore. 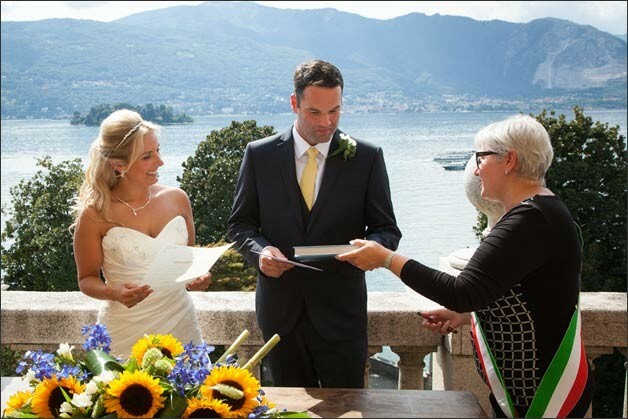 Civil ceremonies can be performed inside the lovely rooms of the villa, outside in the garden just be the shores or on top of the high terrace of the villa with a magnificent view over all Lake Maggiore. 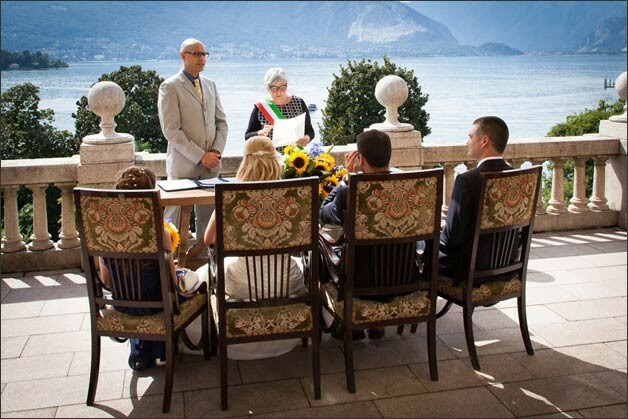 This is the place where Andrea and Simon deduced to tie the knot. Images speak for their own the venue is just amazing… here you can really touch the sky! Ceremony was simple yet very moving accompanied by the sound of a classical guitar. 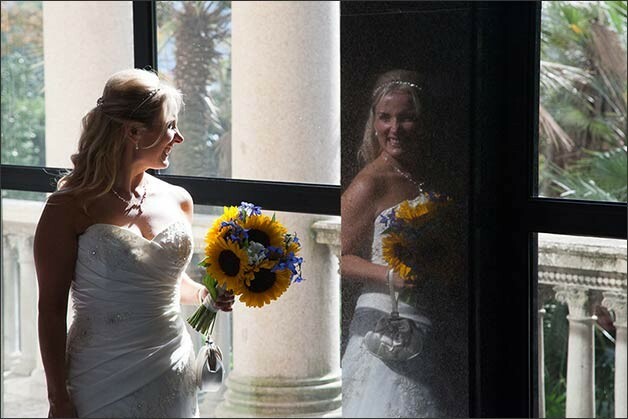 For her floral decoration Andrea opted for sunflowers with blue touches. 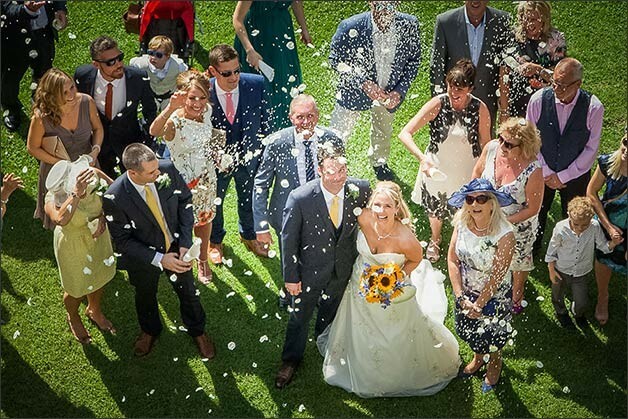 A happy and joyful team for a smiling bride! 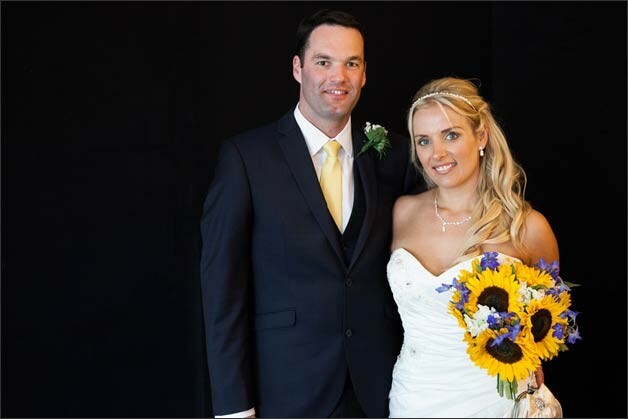 Bridal bouquet, bridesmaids bouquet, ceremony centrepiece and centrepieces at the reception were all made with lovely sunflowers, blue little flowers and greenery. 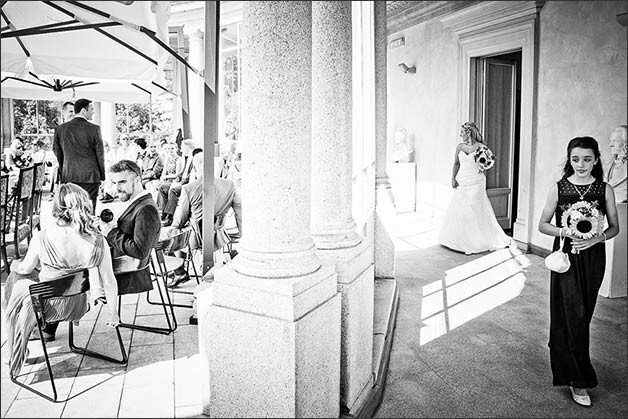 After some romantic shots in the gardens of Villa Giulia, bride and groom share with their guests a couple of drinks in the bar of Villa Giulia. 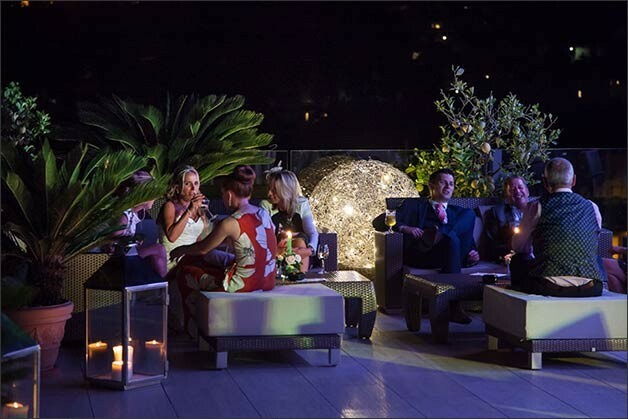 It is a nice bar that stays open all day and even later at night that could be a perfect venue to have a toast right after the civil ceremony at Villa Giulia. 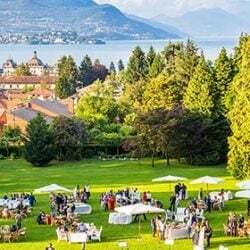 A pretty al fresco area to enjoy Lake Maggiore and its view. 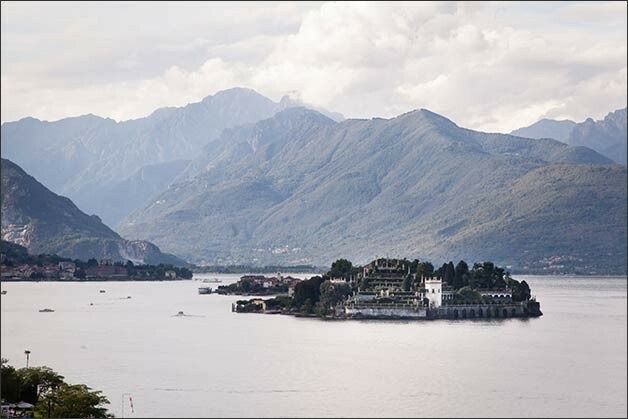 Right after a boat for Andrea, Simon and all their guests took the chance to enjoy a fantastic boat trip on the Lake looping around Borromeo Islands and admiring the beauty of Lake Maggiore coastline by the waters. 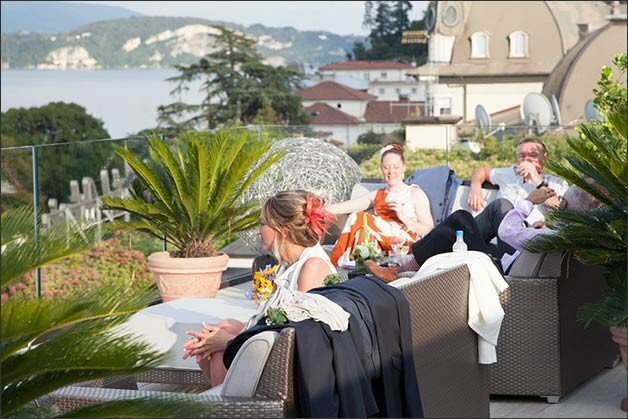 The wedding reception was planned on the roof top of one of the hotels in Stresa: a skybar! 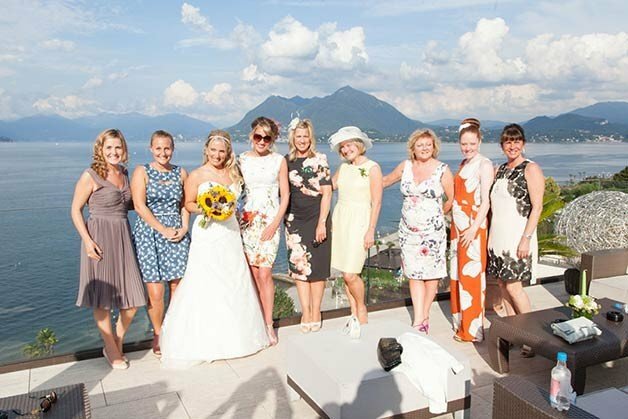 The skybar in Stresa is a fantastic venue for a young and fresh wedding reception on Lake Maggiore. 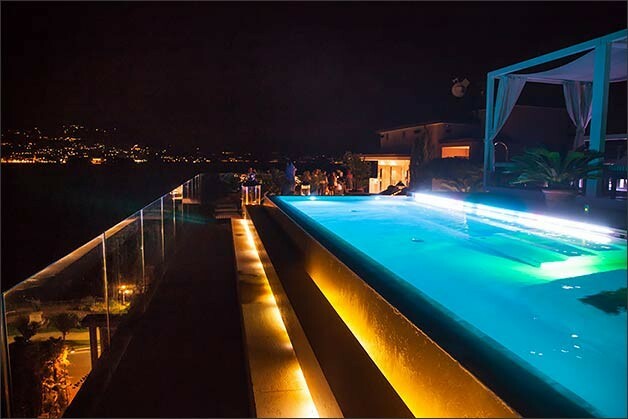 View is simply incredible and the atmosphere is loungey and very stylish. 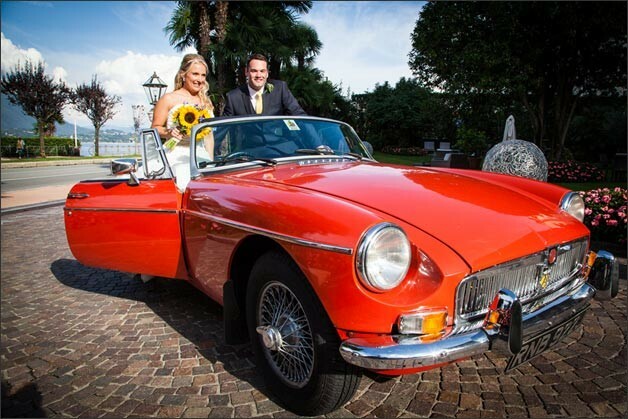 Andrea and Simon had their aperitif overlooking a great sunset on Lake Maggiore and after a gourmand dinner inside the restaurant of the hotel they got back to the skybar for the cutting of a delicious Italian wedding cake. 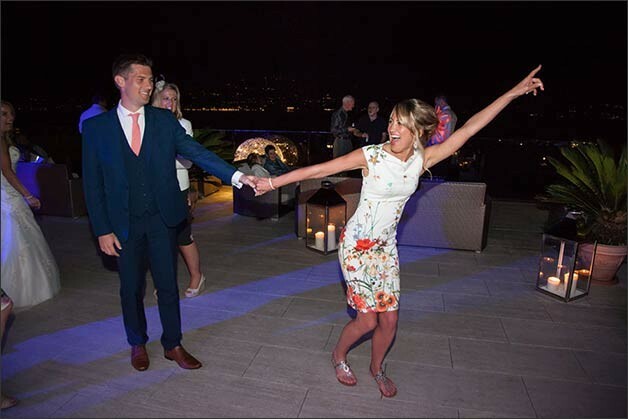 They opted this way as the weather was not stable during the day but with a full summer day with no clouds the skybar can surely host the full reception with aperitif, seated meal and dances to follow. 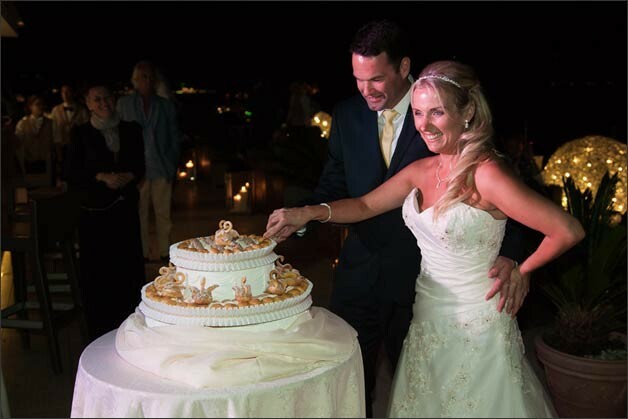 Andrea and Simon’s wedding couldn’t be more romantic and moving but also very fresh, young and impressive!